Remember all that writing you were going to do this summer. I hope you got some of it done. I did. SOME of it, that is. And now here we are, in the middle of August, with the start of the fall semester staring us in the face. And a passel of new full-time and part-time faculty joining us. We’ll be welcoming them with activities next week. I’m writing this post mostly to get myself back onto the Commons and back to blogging. As you may know, I’m an avid Twitter user. My feed, @deanjimberg is filled with higher education news, faculty development experts, and (so it seems) a lot of sociologist and librarians. I’ll be posting soon about how I used Twitter in a class last semester. I’m looking forward to joining some colleagues this weekend at a summer institute organized by the Association of American Colleges & Universities (AACU.org). We’re planning to get some good work done to organize professional development for high impact teaching practices for the next four years. Our goal is to write a professional development plan that is part of a five-year project supported by a Title V grant to expand the BMCC Learning Academy and to improve student outcomes. The Learning Academy will serve more students and expand from a first-year cohort program to serve students in years two and three. The Learning Academy is built on High Impact Practices, primarily a First Year Seminar and Learning Communities. We hope to create a student experience in which high impact practices are the “unavoidable curriculum,” as Carol Geary Schneider and Debra Humphreys of the AAC&U call it in Ensuring Quality and Taking High-Impact Practices to Scale. In the Learning Academy, students begin their first semester in a success seminar (the placemat) that is linked to a discipline course. 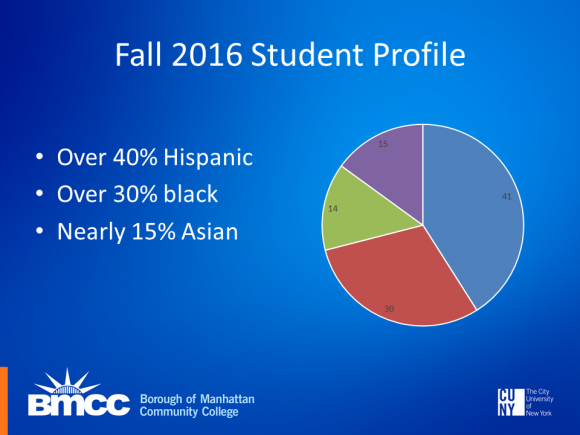 The pie chart illustrates the variety of high impact practices students have to choose from in their time at BMCC. In their first semester they also have access to learning communities and start building their electronic portfolios. All BMCC students need a writing intensive course to graduate, so the purple circle on the top right isn’t a choice. The pie chart suggests food again, but it also looks like the game piece in Trivial Pursuit. So I hope we can present attractive options to students and engage them to collect all the pieces, so we don’t come across as trying to get them to “eat their veggies” in an educational sense. Even before we write the plan, we know the Learning Academy has some specific needs that may also benefit the rest of the college. We’d like to encourage more faculty to get involved, and we’d like to expand and strengthen the learning communities we offer to students. We are also expanding our undergraduate research programming and trying improve student outcomes in Gateway courses. So the plan we develop needs to support our other ongoing efforts. So we’re off on the Amtrak to Boston! Some of the things they mentioned about how to maintain work-life balance, learn about the institution, how to find funding, etc. 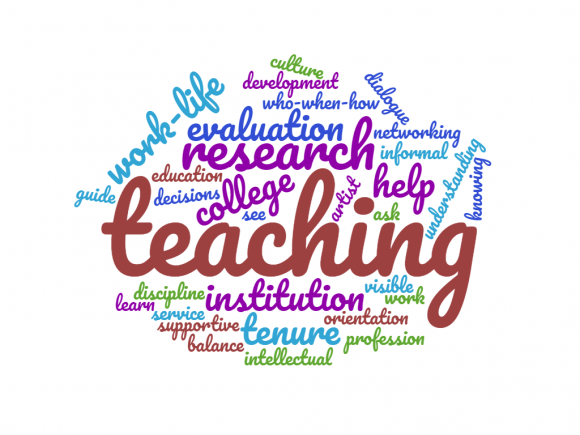 Some talked about the particular attributes of the colleague, such as that they were “very supportive.” Others mentioned a particular aspect of the guidance they were given, such as how to put the mission of the college into their teaching. After that opening discussion, we talked about other aspects of the faculty work at BMCC, particularly about the contractual evaluation of teaching and the tenure and promotion process. Collectively we would like to find ways for these formal and informal procedures to be more supportive and nurturing of the faculty. Speaking for the administration, I said. “The college wants you to succeed. The college wants you to be happy.” I thought this was fairly innocuous statement, but it took some people by surprise. Even though I believe that it has always been true, it is not a message that has often been sent. Too often, administration and faculty are seen as being in opposition. At the conclusion of the gathering, the group was agreed that the college should set up some more formal mentoring system, to complement the mentoring that exists in some of our departments. They also agreed that the old model of a sage, older professor mentoring a younger protégée or novice is neither necessary nor sufficient. The very terms of protégé and novice are somewhat suspect. They resonated with a networked mentoring approach. We will start with a pilot project in the Fall of 2017. We are going to add two or three seasoned faculty members to our semester-long new faculty orientation program. Each mentor will facilitate a cohort of new faculty throughout the term, through small group meetings and conversations. In addition, one or two experienced online faculty will work with a cohort of instructors teaching their first online course in the fall. When we sent out a notice asking for faculty to lead one of these groups, we were surprised and impressed to get nearly 25 respondents within a few days. Clearly, there is a lot of faculty expertise out there to be tapped. It’s gratifying to know that faculty want to share with each other, to help their newer colleagues to be successful and happy. Yun, Jung H., Brian Baldi, and Mary Deane Sorcinelli. “Mutual Mentoring for Early-Career and Underrepresented Faculty: Model, Research, and Practice.” Innovations in Higher Education (2016), 41:441-451. Sorcinelli, Mary Deane and Jung Yun. 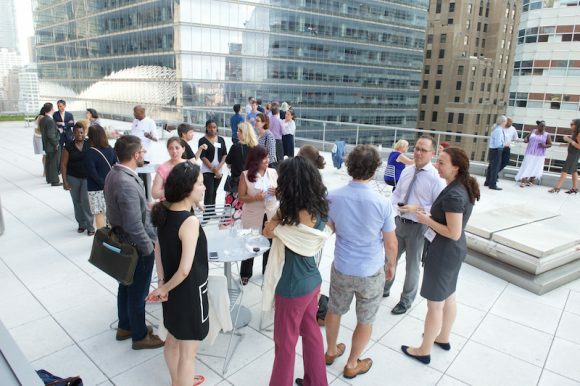 “From Mentor to Mentoring Networks: Mentoring in the New Academy.” Change, Vol. 39, No. 6 (Nov.-Dec., 2007), pp. 58-61. BMCC was awarded $371,750 to continue our initiative in 2017-18. In spring 2017, CUNY was allocated $4,000,000 from New York State to establish, sustain, and enhance new and ongoing open educational resources (OER) initiatives throughout CUNY. This funding must be spent in FY 2018. The expected result will be large-scale course conversions throughout the university. This initiative seeks to engage faculty in the redesign of courses through the replacement of commercial textbooks with OER and other no-cost, freely available options (e.g., library materials, websites, streaming video sites). The short term goal is to eliminate course material costs for students, when possible, and accelerate their progress through college, but an important secondary impact is to change the culture to create systems and structures that better connect curriculum and pedagogy. CUNY Office of Academic Affairs through the Office of Library Services will be coordinating the distribution of funds and issuing RFPs for specific initiatives. Of particular interest in the first RFP, CUNY Scale-up OER Initiative, are proposals that target high enrollment general education classes or “Z” degrees (entire OER Zero Cost Degree pathways). To be eligible for the CUNY Scale-Up Initiative, CUNY colleges must commit to converting at least five courses to OER with five sections per course, and may convert up to 25 courses with five sections per course. This funding’s purpose is to develop, enhance and institutionalize new and ongoing OER initiatives across CUNY. 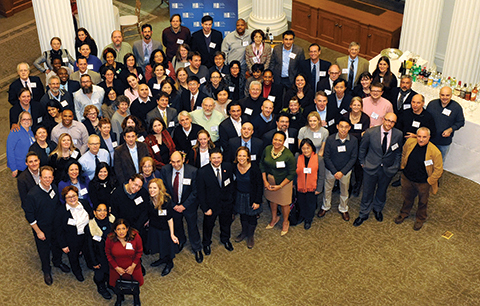 Our goal is the establishment of CUNY as a national leader in OER. From BMCC Library OER site. This is an exciting opportunity for CUNY and BMCC is leading the way! BMCC’s Open/Alternative Textbook Program is a faculty development seminar focused on eliminating course material costs for students while facilitating transformative pedagogical approaches. 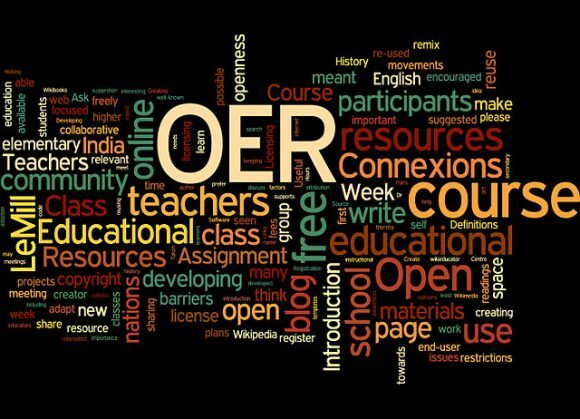 BMCC is also participating in Achieving the Dream’s Open Educational Resources (OER) Degree initiative. Since spring 2015 through these two programs, over 75 faculty, from 15 of our 17 departments, have converted their course materials from commercial textbooks to OER and other no-cost materials available online and through the Library. Faculty currently teach approximately 175 sections of zero textbook cost courses for estimated annual savings to over 4,000 students of close to $450,000. As of this coming fall, we estimate faculty have saved students over $1,000,000 since the beginning of the project. Hooray! We have our first guest blog by Director of Research, Alona Bach. 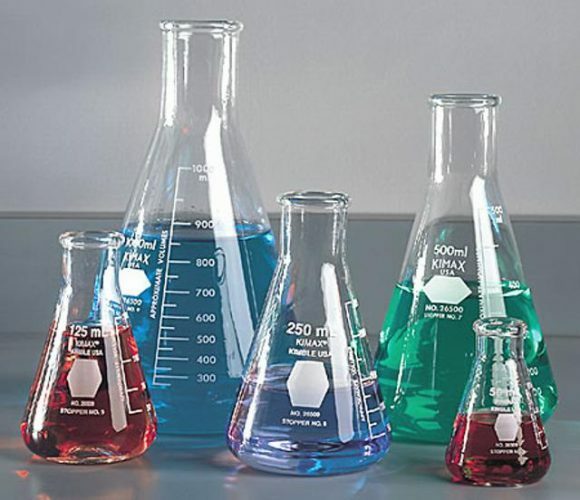 The concept of academic research, and particularly undergraduate research (outside the classroom), has been associated with the image of white lab coats, fancy laboratories, Erlenmeyer flasks and more often than not, an unreachable, mysterious, time-consuming activity saved for the most talented and most elite students. At BMCC, we are redefining what it means to be a student engaged in undergraduate research. BMCC has become my template for rediscovering and redefining what academic research really is. While the fundamental attributes of a researcher remain, and will always include, persistence, consistency, commitment, patience and the fundamental existence of a thick skin, the predictive validity of age-old characteristics for a successful researcher such as GPA, age, gender, year in school or socio-economic status are proving to be outdated and perhaps defunct. While BMCC does harbor an incredibly beautiful and fancy research laboratory (or two or three) and certainly has its fair share of lab coats and Erlenmeyer flasks, the student engaged in research at BMCC is a community college student. This community college student is more than likely to be an under-represented minority student with a job, family obligations and a full course load. The student may be in his or her first semester at BMCC or 2nd ,3rd or 8th or 9th semester at the college… and may have at one point required remedial coursework. Yet this student will ultimately publish in a peer-reviewed academic journal with his or her faculty mentor and present his or her work at a national academic conference. This is what the undergraduate researcher looks like at BMCC. We have grown to a critical mass of such student researchers across all disciplines with the guidance and leadership of stellar faculty researchers. Does that make BMCC a fledgling research institute? I believe that we are. 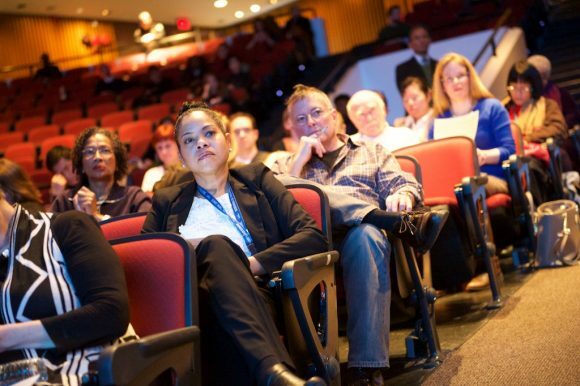 BMCC is pioneering a new path for fundable, novel research of the caliber that is competitive with many of the reputed research institutes in academia. To add momentum to our growing research culture and community, our concept of the undergraduate researcher is being supported and nourished by an evolving and ever present role of the faculty research mentor. Faculty researchers are provided an infrastructure to create and build their research agendas. They are provided training in grant writing and financial support to train and groom student researchers as their apprentices. The faculty and student researchers feed into each other’s fundamental drive to create and discover. This reciprocal, creativity driven relationship results in an intellectual breeding ground full of untapped talent and endless potential. So while undergraduate researchers at BMCC will spend countless hours with their mentors working on their projects just like any other researcher out there, the drive, the will and the bravery to commit these countless hours (that they fundamentally don’t have) comes from the purest of places- the essential “need to know.” It’s curiosity that drives all research. As a result of the College’s investment in research and the work of our faculty and students in building a research community, BMCC is gaining traction and recognition from administrators in higher ed, funding agencies and discipline-specific research communities. This has likely increased the number of excellent successful faculty and high caliber students that we attract which only feeds into our continued growth as a research-heavy community college. This positive feedback loop drives the college into unchartered territory where the community college student becomes the face of the undergraduate researcher. Good morning and welcome to our first annual Faculty Convocation. Thank you all for joining us. We are very pleased to have to have this opportunity for collective conversation about teaching and learning in support of student success. Creating opportunities for faculty dialogue about student success is essential to our goal of improving student success. We can’t possibly do that without a collaborative culture, an intentional design for student success, a culture of inquiry that systematically studies our design for student success, and a design grounded in shared guiding principles and a shared understanding of how we define student success. So this morning I’d like to talk a little about different lenses through which to view student success, share some guiding principles that are important to me, and pose many questions throughout. I see asking questions and encouraging dialogue as one of my primary roles. Hopefully you will have comments or questions at the end, and we’ll continue our collective conversation throughout the day and the semester. – second, more pointedly, in terms of degree completion, successful transfer, career achievement, lifelong learning, and civic participation. So I ask you in our collective design for success, which of those indicators are most important to you, as a faculty member? How do we design for success in those terms? And what is the role of faculty leadership in realizing the design? Strengthen college readiness and improve the effectiveness of developmental offerings, with our sharp focus on curricular and pedagogical innovation in remedial offerings. Improve the student experience, with a particular emphasis on improving advisement and student outcomes in gateway courses. Prepare students for 21st century careers and contribute to workforce development in NYC with an emphasis on improving the STEM pipeline, and expanding internships and experiential learning, including undergraduate research. Cultivate institutional transformation, innovation, and sustainability, particularly through enhanced professional development and by developing the theory and practice of faculty leadership at BMCC. Again I ask you to consider, which of these priorities is most important to you as a faculty member? How do we design for success in those terms? And what is the role of faculty leadership in realizing the design? What does student success from a teaching/learning perspective, a classroom perspective mean? What does student success from a student perspective mean? What does student success from an institutional perspective mean? What does student success from an equity and social justice perspective mean? I want to talk about each of these a bit more, but first I want to share some guiding principles that ground my thinking about student success. I invite you to think about your guiding principles, and for us to continue a dialogue about guiding principles as fundamental to designing for student success. So these are Karrin’s guiding principles for defining and designing for student success. You could also call these fundamental working theories. Either way, this is about developing a collective narrative about where we want to go as a college, about our hopes, dreams, and aspirations for our students. Students can learn anything under the right conditions. Rather than viewing poor preparation and students’ life circumstances as insurmountable barriers, we are deeply engaged in examining our own practices and developing theories and practice about the right conditions under which all students can learn. Every student needs direction and connection. This is about the power of academic planning and engagement, and personalization, and knowing there is at least one person looking out for you, at least one person you can always turn to. Learning outcomes can (and must) improve. There is overwhelming evidence that we can design for improved student success. When colleges have a culture based on student success, faculty and staff consistently invent ways to improve student outcomes. It is possible to move the dial. The college is what our students experience, not what we think they experience or hope they experience or what we experience, but what students actually experience, every step of their journey. We need to deeply understand their experience, and we need their voices in our design for success. Access to success—not just access to enrollment— is fundamental to advancing equity, opportunity, and social justice. This is a shift in thinking about institutional success, particularly for community colleges designed as access/enrollment machines. Access is not good enough. BMCC cannot realize our vision to become a premier community college as defined by student success without strong, visible and pervasive faculty leadership, such that the most effective success practices are recognized and scaled. Put more directly, faculty are the mechanism for scaling success. Defining student success in the classroom: focus on teaching and learning. I’m going to tell two brief stories from my experience as a teacher which symbolize, in simple terms, how I would define student success from a classroom perspective. The first is from when I taught high school English when I was not much older than some of my students. For context, the high school was heavily tracked so that ninth graders were placed in one of three English classes: thoughtfully labeled 9A, 9B1 and 9B2. As the newest and least-experienced teacher, I was assigned 9B2, obviously the lowest level. Many of the students were mortified that they were placed in the class, including one who repeatedly asked if I could shut the door so she wouldn’t be seen by people walking by. One day an angry student threw a folding chair at me; another time a student revealed through an assignment that she had attempted suicide more than once. I was completely unprepared to manage the teaching and learning in this classroom, to rethink my notions of curriculum and pedagogy and engagement. Students passed the class, but there was a missed opportunity for deep learning, a missed opportunity for student success. From the opposite side of the spectrum of student success, for many years I taught a freshmen-experience type class called Dimensions of Learning at the Community College of Vermont. One of the readings was Plato’s Allegory of the Cave, and I was frequently intrigued by how engaged my mostly female adult students were during these discussions. One woman in particular, a single mom with a history of struggle and violence, I will always remember when she exclaimed: “This is me, my life, the chains, the shadows, me not willing to see the truth.” She was intellectually and personally excited about her own learning. The point is that the experience in the classroom had a profound effect on how she came to see her life and her place in the world. She passed the class but her success was much more than that, it was about a change in her belief system. Obviously we want students to pass their courses, but how do we create a culture of student success that goes beyond pass rates, to expand the kind of deep learning that leads to change—in knowledge or behaviors or beliefs or attitudes? Learning that has a lasting impact on how students think or act? Learning that reflects what we believe about what it means to be an educated person. The “intellectual and personal growth” part of our mission statement, the parts about lifelong learning and civic engagement. The part about making the world a better place. How do we most effectively create a culture of student success defined this way? Moving from defining student success from a teaching and learning perspective, from the classroom: How about defining student success from the students’ perspective? During this past registration period we asked 499 students to respond to a brief questionnaire that asked about their goals for being at BMCC and how they would define success. Over 50% indicated that getting a degree was their goal (and half of those specified a bachelor’s degree), and 25% said passing their classes was their goal. The majority defined success in terms of getting a degree, passing classes, and achieving their goals. Getting a degree is their definition of success, including successfully transferring to earn a baccalaureate degree. And 44% defined success in terms of a good career. According to a survey conducted annually by the Higher Education Research Institute at UCLA, students are increasingly reporting that they are going to college to get a good job, and choosing colleges whose graduates get good jobs. This is not to negate the many student responses about becoming a better person and improving the lives of family and others. This is just to say that getting a degree and a good job are fundamental to student definitions of their own success. So how does that align with how we are defining student success from an institutional perspective? We have explicit strategic plan outcomes, linked to our mission statement, for improving retention and graduation rates, degree completions, and successful transfer. Here is a snapshot of how we are doing overall. Our retention rate is stubbornly flat, but the graduation rate is increasing incrementally. The ASAP graduation rate is evidence that student outcomes can improve. In 2016, we conferred 4200 degrees, an all time high. For our transfer students, of our 2015 graduates sixty percent of them went to CUNY colleges, and six percent went to non-CUNY colleges. Our six-year baccalaureate rate for the fall 2010 cohort is seventeen percent for all, and thirty-eight percent for those who complete an associate degree. This brings us to thinking about student success from an equity perspective. Here are some data aligned with our strategic planning student progression model. It is clear that we need to explicitly address equity gaps at every key transition point in our students’ educational journey with us. This is fundamental to our student progress model as a way of defining student success, and fundamental to our historic mission to advance equity and social justice. I encourage us to think about this as a matter of scholarly inquiry into the pedagogical, curricular, and structural strategies that are effective in reducing performance gaps. Again, we can point to colleges who have been successful in this effort. We can and we must improve performance gaps. The Center for Urban Education at the University of Southern California talks about this in terms of being equity-minded, and that equity-minded institutions follow certain principles and demonstrate key indicators. Institutionally-Focused: Focus on remediating the institution’s actions rather than students’ actions alone. Equity must be enacted as a pervasive principle. Critically Race Conscious: Pay attention to whether minoritized groups are participating, feel welcome, and succeed. Systemically Aware: Recognize and counteract institutional and structural racism and other forms of bias, explicit and implicit. Clarity in language is vital. Having the courage to have hard conversations is critical. Evidence-Based: Informed by disaggregated data and qualitative inquiry findings. Questioning assumptions, and clarity in goals and measures are vital. Action-Oriented: Take action to eliminate inequity. Equitable practice and policies are designed to accommodate differences in the contexts of students’ learning, not to treat all students the same. Equity is not the same as equality, a principle we must operationalize. In thinking about student success from an equity perspective, we must also consider student achievement after they leave us, for which students themselves have two primary goals: successful transfer and a good career. I have shared some data about the work we need to do to reduce performance gaps in transfer and baccalaureate achievement. But what about family-sustaining wages and upward mobility? We know that our graduates’ median annual income steadily rises over time, but on average from a starting rate below $25,000. That is obviously a challenge here in New York City. The very good news is that BMCC, in alignment with our mission, is a social justice engine from the perspective of upward mobility. In a recent New York Times op-ed piece entitled “America’s Great Working-Class Colleges” based on a massive big data study that measured students’ earnings after leaving college (whether graduating or not), BMCC ranked third nationally of the 690 community colleges in the study, third nationally in the likelihood that a BMCC student will move up two or more income quintiles from where they entered the college. 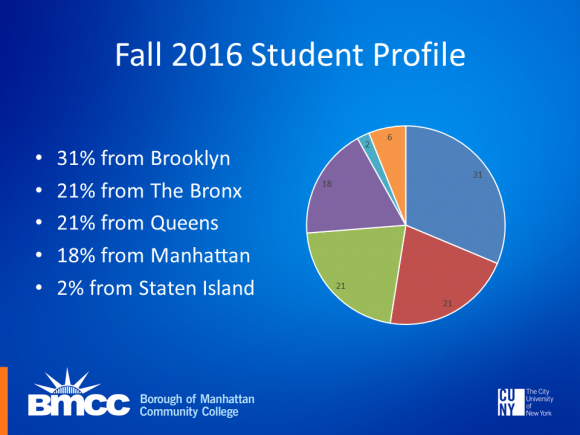 BMCC students have a 41% likelihood of moving up two or more income quintiles as a result of being here. That is a great point of pride for our college, for our faculty, in realizing our social justice mission. Additionally, Baruch College ranked in the top ten in the same study, as 79% of their students from the bottom fifth of the income distribution end up in the top three-fifths. More BMCC graduates go to Baruch than any other transfer destination, and students who started at BMCC made up around 14% of the most recent graduating class at Baruch, so we can take pride in our essential feeder role in ensuring upward mobility as well, a fundamental social purpose of community colleges. We have a vision that BMCC will be recognized as one of our nation’s premier community colleges in relation to student success and academic excellence, known as thought leaders in higher education. So I return to some of my original questions: How do we design for success in those terms? And what is the role of faculty leadership in realizing the design? Let’s consider both design and faculty leadership briefly before I close. The point of this example is that successful colleges collaboratively design for success, a process that begins with dialogue and the collective definition of design principles, and a collective narrative about what student success looks like, inquiry into what’s working and what needs attention— all driving a faculty culture of student success. Designing for success must be disciplined, intentional. We can’t possibly achieve our vision, we can’t possibly improve student success without strong, visible and pervasive faculty leadership. Through a variety of venues, this Convocation included, we are developing our theory of faculty leadership for student success, faculty leadership in formal and informal roles, within and across departments and disciplines, inside and outside the classroom. 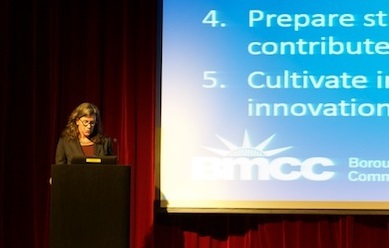 Faculty leadership to make BMCC the kind of organization we want to teach and learn and grow in. A culture that flourishes, as evidenced by continuous learning; a culture that is energized, engaged, generous, compassionate A collaborative culture designed for student success, one that practices and celebrates teaching excellence, the review of evidence, and ongoing experimentation. A culture that respects and embraces the challenges and opportunities related to student success, such that when students don’t succeed, faculty routinely respond with theories of change. Rather than viewing poor preparation and life demands as insurmountable barriers to student success, we deeply engage in analysis of how our own actions can drive stronger outcomes. A culture in which pedagogical leadership is held in the highest esteem. So I thank you for your contributions, both inside and outside the classroom. I thank you for your commitment to student success and excellent teaching. I thank you for your pedagogical and thought leadership about student success from multiple perspectives: teaching and learning, students’ dreams and goals for themselves, institutional priorities, and advancing equity. This is the work before us, designing a culture of student success. As a large, urban college, BMCC has a large, urban faculty. It’s difficult to communicate with them–in any direction. We find ourselves relying on small groups, some elected such as department chairs and academic senate, and email. Our web site posts information. But where is dialogue? Thus we attempted a large social gathering with a message. 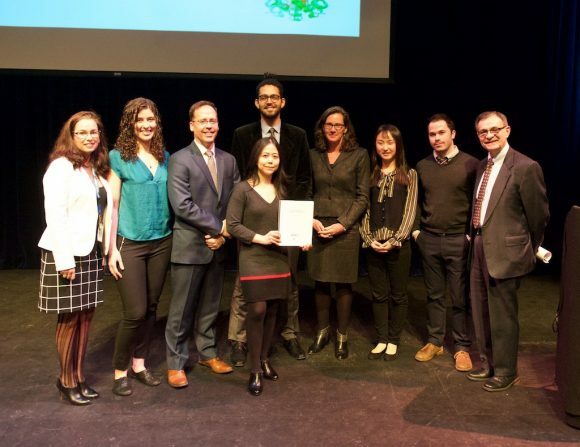 The Borough of Manhattan Community College (BMCC/CUNY) Office of Academic Affairs hosted the College’s first annual Faculty Convocation on January 27 in Theatre I at 199 Chambers Street. Karrin E. Wilks, Provost and Senior Vice President for Academic Affairs, presented a talk on challenges in the community college classroom and evidence-based strategies for addressing them. John Beaumont talked about faculty’s role in student success, with a focus on “how to stay aware, and in tune with what is happening in the classroom.” He questioned the validity of assigning labels to the learning environment; for example, “labeling our classrooms as ‘interactive’, or our students as ‘communicative’,” and challenged teachers to look closely at whatever labels they assign to themselves, as well. After lunch, faculty led other faculty in discussions of teaching and teaching strategies, such as Research in the Classroom, Online Learning, Flipped Classes, and Internships. I think we met a lot of our goals, particularly giving faculty an opportunity to see one another and talk about teaching. Pending results of the assessment of the event, I think we’ll do it again. 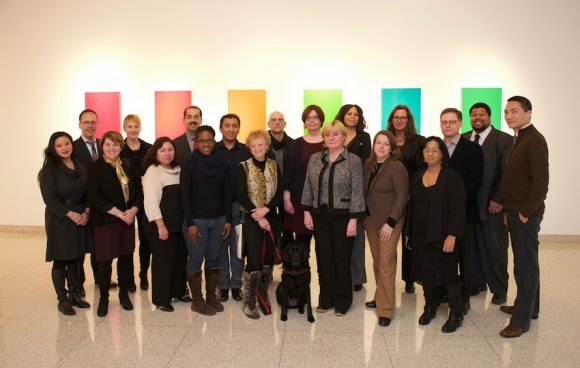 Fourteen Leadership Fellows — full-time Borough of Manhattan Community College (BMCC/CUNY) faculty from 12 academic departments — participated in the inaugural Faculty Leadership Fellows Program, January 9 through January 13, at BMCC. The program was funded by a grant from the American Express Foundation. 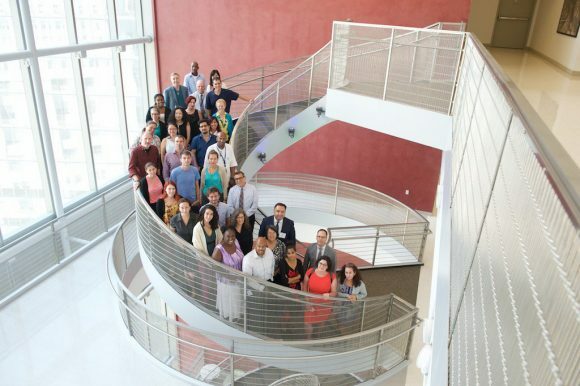 The goal of the LeadershipProgram is to develop faculty leadership and strengthen the participants’ ability to contribute to BMCC’s vision of becoming a leading community college. “We recognize our faculty as leaders in the classroom, department, College and beyond, based on our belief that leadership rests within the person; not within a title, position or office,” says Jim Berg, Associate Dean of Faculty. Faculty fellows with BMCC leadership and American Express sponsor.